Mental health describes an individual’s psychological and emotional well-being, and is often measured by how well one copes with stress. When we dig a little deeper, however, we discover that mental wellbeing influences our relationships, physical health and can hugely impact our ability to live productive lives. Good mental health is characterised by a sense of calm, spontaneous joy, creativity and resilience in times of stress. Like the physical body, the mind benefits from targeted effort. When we physically exert ourselves in a carefully managed way, the body becomes stronger and more resilient. The mind is very similar in this regard. Meditation is one tool that has been used for centuries to put the mind to ‘work’ in a measured and safe manner. In mainstream western society, we have a history of viewing the mind and body as separate entities. Eastern traditions, however, consider them inseparable parts of a holistic system. In the yoga tradition, for example, the body is viewed as a gross expression of the mind, and the mind as is a subtle expression of the body. The practices of yoga are said to integrate and harmonise the two, creating balance and generating sustained health. Modern medicine is catching up with these traditional views. The World health organisation now recognises that stress is a factor in more than 70% of all physical ailments. Over the last few decades, a great deal of research has been conducted into the health benefits associated with meditation. Meditation and other mindfulness practices have been clinically proven to positively impact health in a wide range of ways including helping to manage chronic pain conditions, strengthening the immune system, lowering blood pressure, combating heart disease and even slowing the ageing process. Our 8-week Mindfulness and Movement courses run throughout the year with group sessions on Wednesdays from 6:30-8pm in our beautiful studio in Newmarket. An 8-week course integrating traditional yoga theory and practice with contemporary approaches to health and wellbeing. The course includes 1*45 min one-on-one session, and 7 *90 min group sessions. 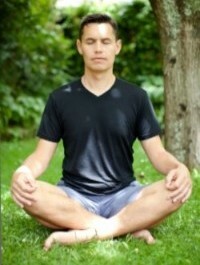 Emphasis is placed on developing mind and body connection through gentle movement, conscious breath-work and meditation. Each week you will be introduced to a new topic related to mindfulness and guided through a practical exploration of these ideas. You will learn proven techniques for cultivating awareness and relaxation and improving concentration. The successful student will leave the course with a range of practical strategies that can be taken into their day to day lives to manage stress, create more enjoyment at work and home, and to improve the quality of relationships. Heyes began practising yoga over 15 years ago whilst rehabilitating from an injury. He quickly discovered that this ancient tradition offers a wide range of health benefits. Drawn to teaching from a young age Heyes spent over 10 years as a lecturer of Art and Photography but lately, his attention has turned to sharing with others the many gifts that yoga has given him. Having recently completed a Diploma in Yoga, he has gained an in-depth knowledge of the history & philosophy of Yoga, anatomy & physiology, Ayurvedic medicine and an array of yoga practices.